Italian food is one of our favourites. This means numerous trips to Italian restaurants all over London. Apart from the potential health hazard from too many restaurant Italian meals, there was another problem. Neither of us like tomato base pastas. Hence we ended up eating risottos, pizzas and spaghetti carbonara all the while. I was getting a wee bit bored and something was telling me that there must be more to pasta than tomato and white sauce. A search in the internet threw up numerous options. 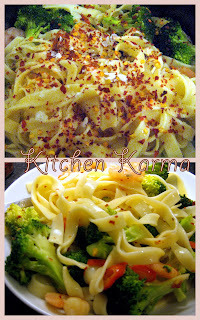 Stumbled upon the site Cooking Is Easy and indeed they had loads of easy pasta recipes. To my delight they even have a separate section on non tomato pasta. Picked up this shrimp pasta recipe (they have a youtube video for this as well) and has been making it ever since. Made some changes over the trials and now it is a favourite regular in our dinner menu. I can go on and on about how nice this pasta dish is. It is really easy to cook, most of the times you can use your pantry and freezer stock to make this, so makes an ideal emergency dinner. About the taste-- I love the buttery, garlicky and lemony flavour of this dish and the shrimp add their own magic. The chillies, my Indian influence, increases the heat quotient and the greens, another addition of mine adds colour, flavour and of course makes it more healthy. Okay, okay I should just stop and let you check out for yourself what I am raving about. Boil the linguini according to instructions on the back of the packet. Make sure that you flavour the water generously with salt. The Italians say that the water in which pasta is boiled should be as salty as that of the Mediterranean. Once the pasta is soft yet has a bite to it, drain the water. Please retain one fourth cup of the water to thicken the sauce later. Use whichever green you have in your fridge. This is a very accommodating recipe. So far I have used spinach leaves/ broccoli/broccoli flowers to make this pasta. You can also skip the veggie, the original recipe does not have any. I just like to use this occasion to eat some green. If using veggie, steam the veggie for a couple of minutes or according to their cooking time and keep aside. In a pan add the olive oil and a knob of butter and then the minced garlic and the chopped red chilly if using any. Once the garlic turns a little brown and gives off a nice garlicky aroma, add the shrimp seasoned with salt and pepper. Cook for 2 to 3 mins till the shrimp turn pink.Toss in the steamed veggies and coat them in the grease. Keep the shrimp and veggies aside.In the same pan add the wine and the 2 table spoons of the pasta water and the lemon juice. Reduce this by half, stirring occasionally. Once the liquid has reduced to required quantity add the remaining butter and add back the shrimp and veggies, and the pasta. Sprinkle some red chilly flakes some crushed sea salt and of course some love. Turn off the heat, mix well and the pasta is ready to be served. This tastes awesome with a glass of chilled white wine. Mangiare Bene Il Mio Amico! That looks very inviting Suchi. 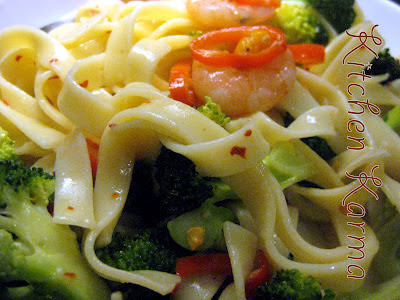 Hi Suchi, your pasta sure look delicious and tempting. Thanks for leaving a nice comment in my blog. I'm following you. Yummy and delicious looking pasta. Very healthy as well. Your pasta looks delish! 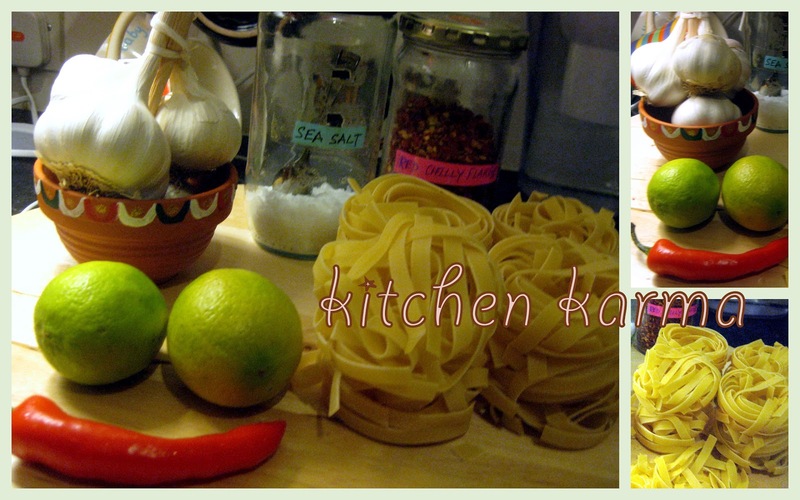 I love anything with shrimp and pasta! Yummm..Thanks for visiting my site! You have gained a new follower! I hope you have a wonderful week! Thanks for visiting me :) this looks rather tasty. Always love a comforting Italian meal! I am a vegetarian but this does look nice and your addition of vegetables makes it look a lot better! Did you create this website yourself? Please reply back as I'm wanting to create my own blog and want to learn where you got this from or just what the theme is called. Cheers!